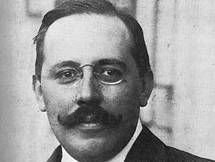 Joseph Maria Olbrich was an Austrian architect who was a co-founder of the Vienna Secession. Olbrich was born in Opava, Austrian Silesia which today is part of the Czech Republic. Olbrich studied architecture at the Wiener Staatsgewerbeschule and the Academy of Fine Arts Vienna where he won several prizes. In 1893, he started working for Otto Wagner and it has been speculated that he did the detailed construction for most of Wagner's Wiener Stadtbahn (Metropolitan Railway) buildings. 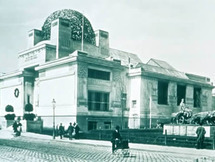 In 1897, Olbrich along with Gustav Klimt, Josef Hoffmann and Koloman Moser founded the Vienna Secession artistic group. Olbrich designed their exhibition building, the famous Secession Hall Building, which became the movement's landmark. In 1899, Olbrich among other leading artists was hired to participate in the planning and execution of exhibition buildings for Hesse as part of the Darmstadt Artists' Colony. 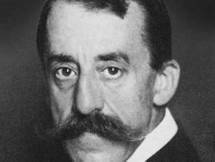 Olbrich gained Hessian citizenship in 1900 and was appointed to a professorship by the Grand Duke. In the following years, Olbrich executed the most diverse architectural commissions and experimented in other fields of applied arts and design. He designed pottery, furniture, several book bindings, and musical instruments. His contribution to the Louisiana Exhibition in St. Louis were highly recognized, and he was appointed corresponding member of the American Institute of Architects, some speculate that this was at the instigation Frank Lloyd Wright but there is no formal recording to confirm this. His architectural works, especially his exhibition buildings for the Vienna and Darmstadt Secessions, have had a strong influence on the development of the Art Nouveau Style.